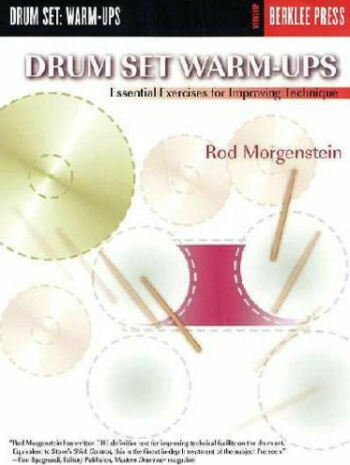 Tiger Bill Reviews Rod Morgenstein's Book Drum Set Warm Ups from Berklee Press. I've seen drum books before that claim to offer warm-up exercises for drummers only to bring you a series of standard weightlifting routines and ideas for using heavily weighted drumsticks that they claim will build up your chops. While some light weightlifting is definitely good for your body (as long as it's accompanied by proper stretching exercises to maintain flexibility), standard exercises really have little to do with warming up a drummer's body properly. Rod's latest book attempts to fill this void by offering a series of exercises designed to imitate - and sometimes exaggerate - the exact range of motions drummers can encounter from executing cross-stick patterns to reaching for drums and cymbals far in the outfield. As a bonus, many of these exercises are also designed to increase the speed and endurance of your hands and feet and improve your overall coordination. Rod told me about his book during our interview at the Modern Drummer Festival (see the sidebar) but I just recently had the opportunity to sit down with it at the kit. Whether you're into sports or drumming, the best warm-up routine is one that imitates the motions that you will be performing during the activity itself. This is exactly what Rod set out to do. His book is organized into 33 lessons plus one final lesson that combines all of the previous lessons into what you could use as a quick warm-up routine prior to a concert or drum lesson. The first seven exercises utilize sixteenth-note strokes moving around the drum set, first with the right hand only and then with the left. Later Rod varies the sticking patterns to include single strokes, double strokes, open rolls, and paradiddle combinations around the drum set. He also includes a page on three-note patterns that use combinations of eighth- and sixteenth-notes. The next five lessons repeat the exercises similar to those in the prior sixteenth-note section, this time using eighth-note triplets. Lesson 13 introduces crossover sticking as applied to sixteenth-notes and eighth-note triplets. Lesson 14 uses alternating eighth- and sixteenth-note patterns to practice doubling and halving the tempo. Lesson 15 does the same except with eighth-note triplets and sextuplets. The next six lessons concentrate on warm-ups for the feet, and include endurance and coordination exercises that alternate between the hands and feet. The best drummers can place accents anywhere at will and Rod's next two lessons are designed to help you develop that facility. Lesson 24 concentrates on playing various flam rudiments around the drum set while the following lesson does the same with paradiddle variations. The following two lessons give your arms a workout as you reach out for those cymbals. Lesson 28 gives you some open and closed roll workouts around the drums. Lesson 29 applies drags and ruffs to the set. Lesson 30 gives you a workout with flat flams. The next two lessons concentrate on applying various crossover patterns to the set. Lesson 33 gives your imagination a boost, as Rod explains how to create a variety of exercises from a single idea. Because I constantly stress the importance of creativity, I especially appreciated this lesson. The final lesson is designed as a summary of all previous exercises and, as such, makes for a great balanced warm-up that you can use prior to taking your drum lesson or to prepare for a gig. Avoid injury during actual performance by warming your body up using exaggerated motions around the drum set. Train your mind and body to build the necessary neuro-pathways to increase your speed, accuracy, agility, control, dexterity, and dynamics around the drum set. Increase the power, stamina, and endurance of your entire body. Perform complicated crossover patterns with ease and relaxation. In a day when too many "new" books are simple reworks of older existing material, it's refreshing to see a book that is truly different and really practical. I intend to use it every day to improve my drumming. I recommend that you do the same. Rod's book, which retails for a reasonable $12.95, is published by Berklee Press.